QUESTION: I really love the article about frugal diaper washing. We live in an apartment, and it's so inconvenient to wash cloth diapers so we stopped CDing my daughter last summer when she was about 10 months old. Then we tried CDing again a month ago with the same cloth diapers we had last summer, they are one sized fitted. It's still a hassle to go to laundrymat twice or more a week. I'd love to just to do laundry once a week at same time wash our clothes. So, I bought Gdiapers (flushables with Gpants to use for outings and prefolds to use with Gpants at home) to try out. I'm afraid to try it yet. I have some prefolds. ANSWER: Sorry, I have no personal experience with Gdiapers or WonderWash, but they sound like great alternatives. Have you considered flat diapers? 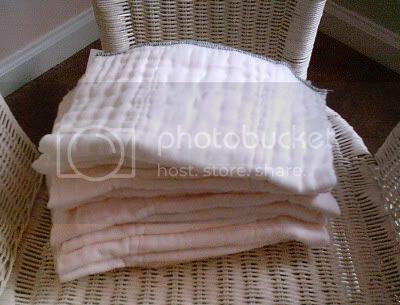 If you can't find them, receiving blankets work well as diapers and can often be found at 2nd hand shops cheaply. They dry very quickly, you could hang them on a retractable line in your bathroom, or on your balcony. To speed drying, put a fan in fron of the diapers. Check out my Diaper Washing_: Diapering in an Apt. tip for some suggestions.